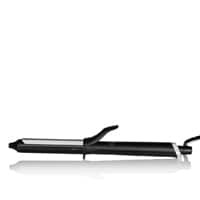 I purchased the ghd soft curl tongs a few weeks ago and I have been really impressed with the product. They do exactly what they claim. I have long layered hair and I find the tongs exceptionally easy to use, as you can twist the hair around the tongs according to the length and release the grip so you can include the different lengths of hair. I would definitely recommend the product if you have long hair and want to maintain a curl or wave that stays in. The extra large barrel of the tongs ... read more (32mm) allows you to create soft curls that look natural. The speed at which they heat up and are ready to use is also a bonus. The swivel cord also prevents the cord tangling and makes it easy to change direction when curling your hair. I struggled to purchase the tongs for several weeks as the product was sold out everywhere I tried! My only disappointment is that the tongs do not come with a heat mat, although they do have a built in stand with the tip remaining cold so you can place on a surface when not in use. This is the third ghd product I have purchased as I already have the straighteners and the hairdryer all of which have lived up to expectations, I will definately be purchasing some more of these tongs for my daughter at a later date. A deserved 5 star rating! Deliberated for ages before buying this but shouldn't have worried. Was just what I was looking for. Gives a lovely loose curl that you can either leave as is or brush out for a big bouncy curl look. I find the tong much easier to use than my wand and being GHD the heat up on this is super quick. Great purchase. This product is brilliant! I finally replaced my old tong with the GHD tongs and now wonder why I didn't do it sooner! I love the fact it heats up so quickly, and glides through my hair leaving a lovely curl - WHICH LASTS! I often only curl by hair every other day as I love the second day look. It feels like a quality product to use too! Can not recommend enough. Even better, I ordered on a Friday evening and it arrived on the Saturday morning - THANK YOU GHD! Another great product! When buying this product I was uncertain what to expect , I wanted to achieve a classical ringlet curl as opposed to waves , the curling tong most certainly does achieve that look as opposed to a wand which will give a more effortless look , very happy with this tong ! Discover our range of professional ghd hair straighteners for smooth, sleek, healthy looking style that lasts.